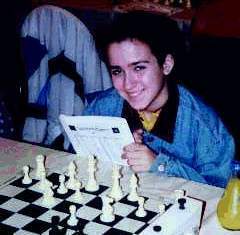 International Grandmaster (GM) Michael Rohde of New York City was in hot form on August 15th, 1996, burning up the rest of the field with a 2675 tournament performance en route to victory at the Marshall Chess Club's Thursday Night Action Tournament. GM Gennady Sagalchik of Brooklyn turned up the heat even more, blasting out a 2758 tournament performance to share First Place with Rohde. Both players went into the last round a half-point shy of a perfect score: Rohde drew his third game against 19-year-old Brooklyn Senior Master Boris Kreiman, while Gennady "spotted" the field a half-point bye in Round 1. Faced with a "must-win" scenario in the last round, that's exactly what they both did! Sagalchik overpowered Kreiman on Board One, while Rohde won a wild, exciting game against IM Maurice Ashley on Board Two. Each GM took home $150 for the night's work, finishing with 3½ out of 4. Tying for Third at 3-1, were Ashley, along with GM Max Dlugy, of Engelwood, NJ (who lost to Ashley in another wild game the round before), and NM Lewis Eisen of Cherry Hill, NJ. Alexander Beltre of the Bronx finished up with 2½ points and a 2372 performance to clinch the Under 2000 Prize. FM Ron Young directed the 22-player, Grand Prix tournament, which featured over twelve Masters, including three GM's and two IM's(! ), for the Chess Center of New York. The Original "Four Rated Games Tonight!" series, held each Thursday at 7 pm at the Marshall Chess Club in New York City, is America's longest-running Action Chess tournament, featuring a special "Grand Prix" edition once a month.